Not Just Another Mother Blogger! 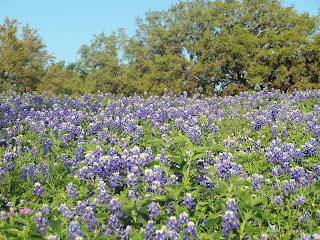 : Bluebonnets! 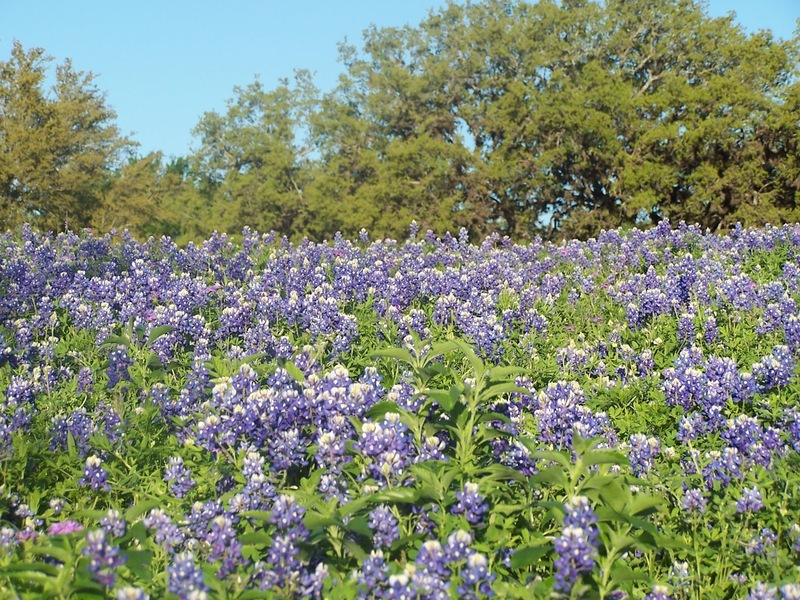 Bluebonnets are the state flower of Texas, and they have roared to life after we had a bunch of rain. They have popped in places where I've never seen them before, and it has been wonderful. 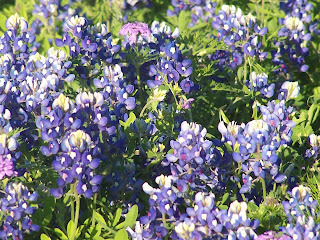 We wouldn't have this many bluebonnets if Lady Bird Johnson hadn't devoted time to planting wildflowers all over the place. Thank you, Lady Bird! It certainly makes spending almost four dollars for a gallon of gas feel mildly better when you can see these on your way to work in the mornings. Contrary to popular belief, it is not against the law to pick these flowers. The likelihood that someone will shoot you for doing so is high, however, especially if it is a mother trying to take Easter photos of her darlings among these blooms. I try yearly to take photos of my son in these flowers, but he a)does not ever sit still, b)does not like to sit on the ground, and c)doesn't like spiders to crawl on him. I've taken to carrying my camera around in my car so that I can pull over and snap pictures when I see something interesting. 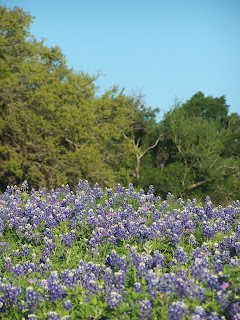 These are growing all along the roads in the Hill Country around the New Braunfels area. There are some white bluebonnets around here, but not in a place where I can easily pull over without being hit by a random senior citizen out for a jaunt. I just love looking at them. I'd like to have pictures of all the wildflowers indigenous to the state, but that would require more effort than I'm willing to put forth. What about you? Has spring sprung where you are? If so, what wildflowers are visiting your neck of the woods? Well ... spring's about 5 or 6 months away downunder ... And that's when the glorious weed known as Salvation Jane (or Patterson's Curse) flowers in purple profusion all over the hills. If I didn't sometimes live on a farm I'd think it was beautiful!! PS Can't you photoshop Zane into the flowers? Win-win!! The FIRST things we see in Pittsburgh that presage spring are: forsythia, and crocuses. They have bloomed and faded already. We are WELL under way here. Here in Oregon we have yellow daffodils, and red, orange, and pink tulips blooming. Due to the crazy early warm weather we had, the crocus, primrose, and daffodils have come (OK, my daffodils didn't flower) the tulip greens are up,as are my iris. Wow. Gorgeous! We don't get any wildflower fields like that here. We have to satisfy ourselves with fields of canola and sunflowers.